Home / Columnists/ Look, my streetlights are on! Look, my streetlights are on! 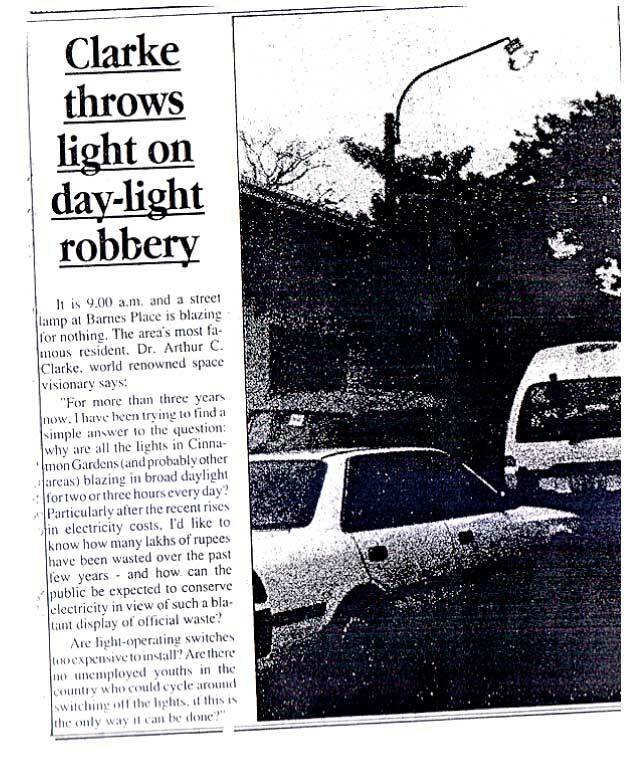 I remember late Arthur C. Clarke used to write to the press quite often when we had power shortages – and there were many such instances I must say, indicating lit streetlights in Colombo in the middle of the day even in times of power shortages. 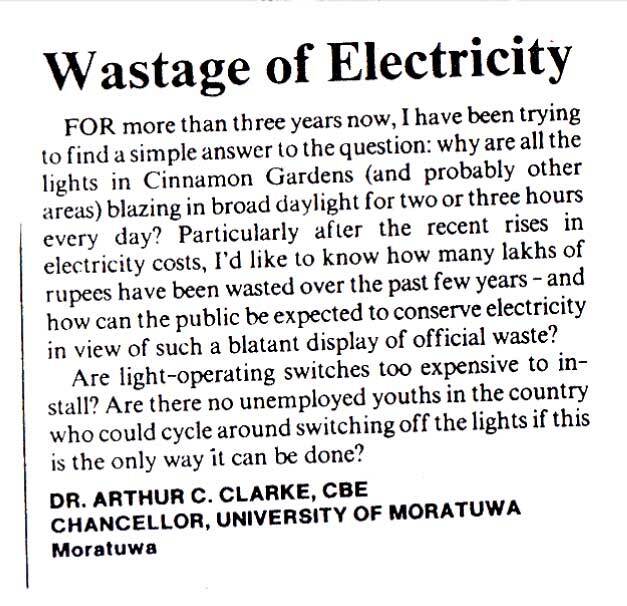 Perhaps late Arthur gave up the exercise as either the newspapers were not being read by those who had the power and the ability or we were believing streetlights anyway do not consume much power and a few being lit at all times is not exactly a crime against humanity. He was asking for solar systems, more control with the ability to switch off when not needed, etc. However, we can continue to see the situation in some places. Yes the technology has been improved with solar streetlight systems having entered into use. There are many streetlights still managed by households which are by the side of a road and there is some deprivation of revenue to the CEB in that process. What is still evident is we are yet to master this service provision of running the streetlight system economically while serving the community when and where it is needed. It was a refreshing and an impressive presentation that the Chief Minister of Andhra Pradesh – Nara Chandrababu Naidu – gave when he was in Sri Lanka on 8 January as the Guest of Honour on invitation of the President of Sri Lanka at the third year inauguration event of his ascendancy to presidency. The President had invited the Chief Minister to attend the celebrations of ‘Dawn of three years of sustainability of Sri Lanka’. His speech had so many points to ponder and perhaps was a demonstration of someone who is in charge and with the perfect understanding of the situation – a sign of a politician in true command. The comparisons, SWOT analysis, and plans underway along with details clearly indicated a person with a mission. The speech was of more substance than rhetoric, of achievements than promises. Of course he is not new to the position with a solid history of performance in AP. There may be critics – who have not – yet what AP and Hyderabad in particular has achieved in the areas of information technology and biotechnology are quite impressive. His slogan in moving Hyderabad forward with inward investments and development, ‘Bye-bye Bangalore, Hello Hyderabad’ is certainly interesting as at one point Bangalore was the Poster City in India for innovative growth and prosperity. His list of recognitions is interesting from being named the IT Indian of the Millennium (India Today), One of the ‘hidden seven’ working wonders around the world (Oracle) to a Honorary Professorship from Kellogg School of Management in USA. One of the key demonstrations of his speech was the CORE Dashboard of the Chief Minister of Andhra Pradesh. He was demonstrating that having real time access to key performance aspects of government a bird’s eye view of performance of different schemes, initiatives, programs of government departments. 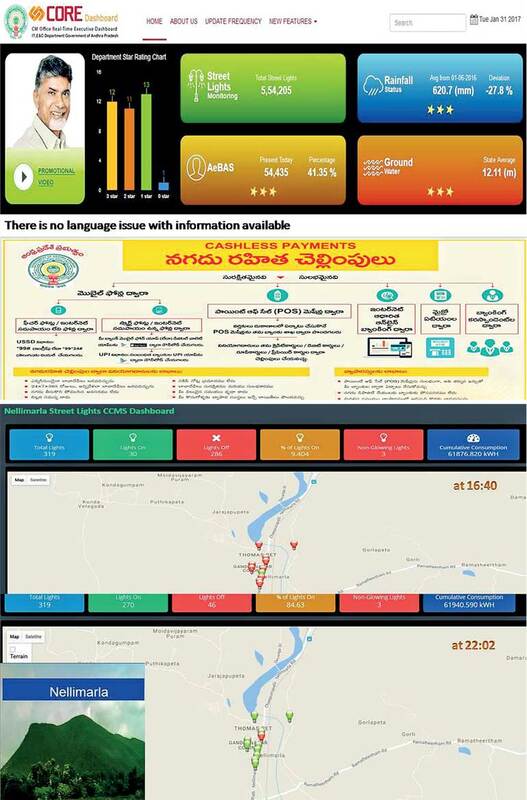 To quote from the site itself, CORE (CM Office Real-time Executive) Dashboard a pioneering initiative of Government of Andhra Pradesh is a visual display of the department’s information which need to achieve one or more objectives; consolidated and arranged in a single frame so that the information can be monitored effectively by Chief Minister and by other state leaders at a glance. A total of 34 State Government Departments are integrated in the CORE Dashboard. Various key statistics of related public departments are updated and published in the CORE Dashboard, which provide key insights of Department activities. The singular purpose of CORE has being identified and is monitoring and communication. The CORE Dashboard is designed and developed to address wide range of objectives and monitoring the strategy of Government of Andhra Pradesh which can check on department’s activities in order to achieve service-level targets. It is important to see the key characteristics of the CORE dashboard which is an eye pleasing web display; all the visualisations pertaining to all departments fit in a single screen; it displays the department’s key performance indicators that can be monitored; indicators such as filtering and drill-down can be used in dashboard; department’s key performance indicators actions which also include lag and lead performances district wise, etc.. The Core Dashboard can be accessed by the Departmental HODs/Officials to monitor effectively and take necessary actions if needed; the data gets automatically updated without any assistance from the user. The frequency of the data updating will vary with the departments. Dashboard data gets updated on a daily or in an identified basis. Hopefully the back operations are streamlined, controlled, validated as to ensure that GIGO (garbage in garbage out) situations do not materialise! In open transparent governance keeping and ensuring trust and fairness is a key and technology deployed should be to support such. All what is good and bad is on display in a real time well-connected dashboard. In the presentation his demonstration of the dashboard beyond demonstrating the overall structure was with streetlights! Since the dashboard is accessible to anyone the streetlight example was presented as an example of level of information available to the Chief Minister at any given time. The example is repeated here. The streetlight functionality of Nellimarla region of AP indicates the population of streetlights and around 16.40 (31 January) all most all the lights were off – as they should be. When the CM spoke at BMICH on 8 January, the same situation prevailed as it was day time. The picture dynamically changes as dusk fall as seen from the other picture which provides the situation at 22:02 on the same day. This is real time data availability and functionality demonstration. From the number of streetlights to what is working and what is not, the power consumption, etc. the situation is presented. Both the Chief Minister and the citizen is empowered to sense the situation. Dashboard has 34 sub screens ranging from energy and school education to women’s and children’s welfare. It is equally of interest to note the star ratings on display and the measurement criteria behind them. Public has access to information and with Right to Information (RTI) coming into effect in Sri Lanka from 3 February, hope those in the audience at BMICH were thinking how useful this type of system would be. CORE is not confined to English and this makes it more accessible to citizens. Just browse our websites of local institutes and check for the last updated and the availability in main national languages. This simple exercise will tell us that we have a long way to go. As more than two weeks have passed since that speech and the event hope the whole episode has not gone into the dustbins of memory of the majority present. As there are series of key performance indicators per sector and a defined updating frequency the state public sector is kept on their toes presumably. For one missing streetlight there is the chance that the chief minister himself may be on the line to you! Without any undue stress being created this open governance and targeted performance is a must-have situation. Well these may be the reasons that the Chief Minister had been given an early accolade by no less than TIME magazine when naming him as the South Asian of the Year. TIME commented in bestowing this recognition that in just five years, he has turned an impoverished, rural backwater place into Indian new information-technology hub. This is something that our politicians too should aspire to by way of real tangible outcomes. We must sense action and results than promised rhetoric for the future.